You’ve made it to the final part in our three part series on low maintenance plants. In part 1, we gave you our top 5 low maintenance plants for shade. Part 2, we talked about our top 5 low maintenance plants for your sunny site. 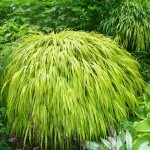 And now, we have our top 5 low maintenance grasses for your Grand Rapids landscape…sun and shade! The cultivar ‘Karl Foerster’ is one of our favorite low maintenance grasses to use in a sunny location. 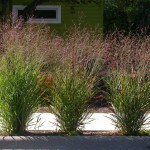 This cultivar of feather reed grass is a neat and stately clump forming grass that grows 4-5′ tall in flower. One of the earliest blooming grasses starting out green in June, the blooms will turn a rose-purple shade in July, and then a lovely straw brown color in August, which is how it will remain through winter. ‘Karl Foerster’ is drought tolerant, salt tolerant, and deer resistant, making it the perfect to add to your Grand Rapids landscape. The native species of carex, or sedge grass, is very cold hardy, and grows from 6″-10″ in a uniform rounded habit that creeps slowly by rhizomes. 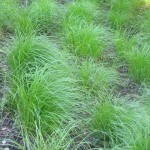 Carex can be used as a turf substitute, since it is walkable, mowable and will tolerate significant drought. This awesome low maintenance grass grows in light to dense shade, tolerating significant shade, it also tolerates sandy soils, and is deer resistant. Carex can be used as a small to moderate ground cover, along boarders, or in rock gardens. Being so versatile, carex is one of the most low maintenance plants you could add to your Grand Rapids landscape. Japanese forest grass can be grown in full sun to moderate shade, along edges, walkways, or as a specimen, reaching between 10″-18″ tall. 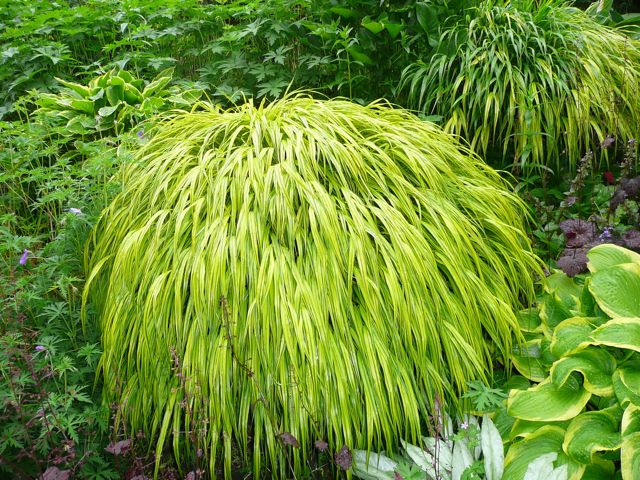 Japanese forest grass brings a tropical feel to any landscape, with its variegated or lemon-yellow slow spreading bamboo like foliage. Japanese forest grass is deer resistant and contrasts amazing against dark colored low maintenance shade plants. Looking for a low maintenance grass that is not too short, but not too tall? You may have found it in a Pennisetum, since its varieties range in height from 8″ to 4′ in flower, averaging about 2 1/2′ tall. 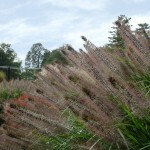 The low maintenance, deer resistant Pennisetum grows in full sun to light shade conditions, tolerating drought and salt. 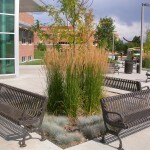 Pennisetum can be used in a mass planting, as an accent plant, a groundcover, or in the foreground. It blooms August through October, some as early as July, with plumes that are fuzzy and bottle brush like, in colors of pinks, tans, and near black. A great native cultivar that grows in full sun to light shade from 3′-8′ tall, you can’t go wrong with adding this low maintenance grass to your Grand Rapids landscape. While other grasses may flop over when rained on, Panicum, or switch grass, will stand up to rain and wind, due to its neat and strong vase shaped habit. Switch grass is deer resistant, drought tolerant, salt tolerant, and comes in a variety of colors. The foliage can be light blue, ste al blue-green, green, and red, turning a nice tan brown in fall. The plumes range in color from light tan, to pink, to white, blooming August through October. Check out some recent projects to get inspiration for your next project, or contact us today to get your project started! Be sure to check out our top 5 low maintenance plants for your shady landscape, and top 5 low maintenance plants for your sunny landscape.